Looking to install Kodi on [easyazon_link identifier=”B011B9E928″ locale=”US” tag=”arizonacaorg-20″]PC[/easyazon_link]? Look no further. 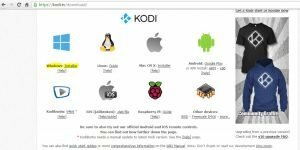 This guide shows you step by step how to install Kodi on your own computer. About this article: This guide was updated in 2017. Which Versions of Windows Does Kodi Work With? Windows 7? Windows 8? Windows 10? To install Kodi on [easyazon_link identifier=”B011B9E928″ locale=”US” tag=”arizonacaorg-20″]PC[/easyazon_link] is simply a matter of downloading the installer, launching it, finishing the installation and launching Kodi. Once Kodi is installed, we recommend that you install some TVAddons to stream content directly to your PC. Since [easyazon_link identifier=”B0172BP1W6″ locale=”US” tag=”arizonacaorg-20″]PCs[/easyazon_link]have more power than most other device types which can streaming media via Kodi, you will probably have the best Kodi experience using Kodi for PC (as opposed to Kodi for [easyazon_link identifier=”B00GDQ0RMG” locale=”US” tag=”arizonacaorg-20″]Firestick[/easyazon_link]or [easyazon_link identifier=”B01C6Q2GSY” locale=”US” tag=”arizonacaorg-20″]Raspberry Pi[/easyazon_link], for instance). For example, most desktop computer built within the last year or two most likely have at least a dual-core processor, which beats the computing power of devices like the [easyazon_link identifier=”B00GDQ0RMG” locale=”US” tag=”arizonacaorg-20″]Firestick[/easyazon_link] and [easyazon_link identifier=”B01DA0YCNC” locale=”US” tag=”arizonacaorg-20″]Roku stick[/easyazon_link]. More power means faster load times when playing media, faster navigation in the menus, and all-around better performance. More power also means jitter-free 1080P HD playback and possibly even [easyazon_link identifier=”B01A0LGV06″ locale=”US” tag=”arizonacaorg-20″]4K[/easyazon_link] playback. You can download Kodi on [easyazon_link identifier=”B011B9E928″ locale=”US” tag=”arizonacaorg-20″]PC[/easyazon_link] by going to http://kodi.tv/download in your browser. Once you’re there, click Installer next to “Windows” (direct download: http://mirrors.kodi.tv/releases/win32/kodi-16.1-Jarvis.exe), like in the screenshot provided here. After clicking the Installer download link, the kodi .exe file should begin downloading. Depending on your connection speed (do a speed test if you’re curious), it may take awhile. But most connections should be able to download Kodi in less than a minute. If yours takes longer, consider getting a new [easyazon_link identifier=”B001FWYGJS” locale=”US” tag=”arizonacaorg-20″]WiFi router[/easyazon_link] or [easyazon_link identifier=”B00AJHDZSI” locale=”US” tag=”arizonacaorg-20″]cable modem[/easyazon_link]. 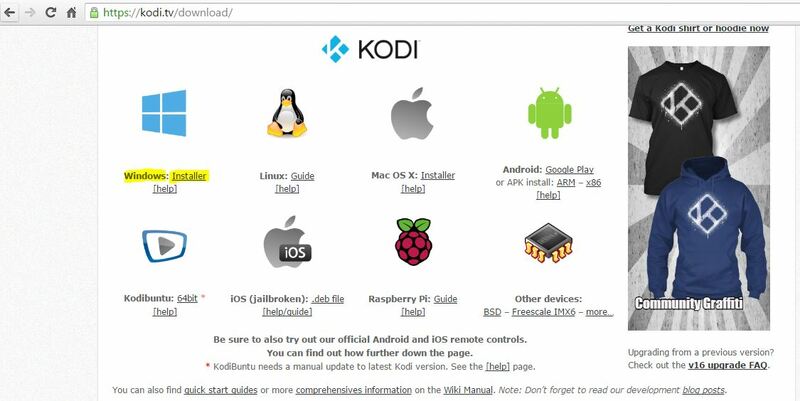 Launch the Kodi installer by clicking on the downloaded file in your browser. The Kodi installer screen should now appear. After the Kodi installer screen appears, follow the prompts to perform the installation. When the installation is complete, launch Kodi. Kodi will be located in your Start menu (search for Kodi in the start menu). Use our guide to install TVAddons in your Kodi PC install. You can play tons of emulators, so check some out and play some classic games on your PC. These days, you can get fancy new [easyazon_link identifier=”B01EO5QPN2″ locale=”US” tag=”arizonacaorg-20″]Bluetooth ergonomic controllers[/easyazon_link] that emulate the look and feel of an [easyazon_link identifier=”B017KIHMQE” locale=”US” tag=”arizonacaorg-20″]Xbox 360[/easyazon_link] or [easyazon_link identifier=”B018V3ISJ2″ locale=”US” tag=”arizonacaorg-20″]PS4[/easyazon_link] controller. Or you can go retro and get a [easyazon_link identifier=”B014QP2H1E” locale=”US” tag=”arizonacaorg-20″]Bluetooth SNES controller[/easyazon_link] or [easyazon_link identifier=”B00NBN1NA4″ locale=”US” tag=”arizonacaorg-20″]Bluetooth NES controller[/easyazon_link]. Download a free computer cleaner such as [easyazon_link identifier=”B00AEZWVC6″ locale=”US” tag=”arizonacaorg-20″]Glary Utilities[/easyazon_link] from http://ninite.com. Make sure your computer’s hardware is running smoothly. Set up [easyazon_link identifier=”B00EVVGAD0″ locale=”US” tag=”arizonacaorg-20″]Network Attached Storage[/easyazon_link] to serve your movies to any device on your network! What Can I Do With My Kodi PC? Install a [easyazon_link identifier=”B00BP5KOPA” locale=”US” tag=”arizonacaorg-20″]wireless keyboard[/easyazon_link]/ [easyazon_link identifier=”B01E6MW13Q” locale=”US” tag=”arizonacaorg-20″]mouse[/easyazon_link] / [easyazon_link identifier=”B011IW9WB6″ locale=”US” tag=”arizonacaorg-20″]media remote[/easyazon_link] to use your PC in your home theater! THIS is an amazing way to use a Kodi PC: Put your Kodi PC somewhere out-of-sight, but within cable range of your entertainment center. Hook your Kodi PC up to your [easyazon_link identifier=”B00WR292JE” locale=”US” tag=”arizonacaorg-20″]TV[/easyazon_link]so you’re using your TV as your “[easyazon_link identifier=”B015WCV70W” locale=”US” tag=”arizonacaorg-20″]monitor[/easyazon_link]”, then sit back on your nice comfy couch and operate Kodi using the media remote you installed! No more mouse & keyboard – just an intuitive, easy-to-use media center. Use Kodi to play Paid media services such as [easyazon_link identifier=”B005ZXWMUS” locale=”US” tag=”arizonacaorg-20″]Netflix[/easyazon_link], [easyazon_link identifier=”B0066TUXU6″ locale=”US” tag=”arizonacaorg-20″]Hulu[/easyazon_link], and [easyazon_link identifier=”B00N28818A” locale=”US” tag=”arizonacaorg-20″]Amazon Prime Video[/easyazon_link]. Good luck! Have questions? Ask us in the comments below!